Labor Day weekend is here and while they certainly tried with a couple of new releases and a notable expansion, the story remains the outstanding performance of Crazy Rich Asians. 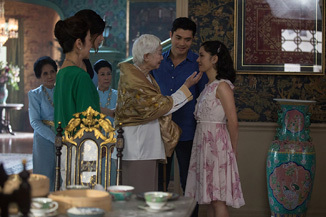 Easily the number one film on the weekend again, Crazy Rich Asians earned $22.2 million in its third weekend, down just 10% from last weekend (when it only dropped 6%), and crossing $100 million in style, with $110.9 million to date. The holiday weekend clearly helped give it a third $20 million weekend, but Crazy Rich Asians didn't really need it. It should cede the top spot next weekend, but the drops should stay small, and by the end of the month we could be talking about a $200 million film, something that nobody was talking about at the start of August. It's only three weekends in, but I can't add much more to this box office performance at this point. In a year with three (THREE!) $600 million films, Crazy Rich Asians may be the biggest box office story of the year. The Meg holds in second place for another weekend with $10.5 million and $120.5 million after four weekends. While it's still under budget domestically, international earnings, especially from China, came through and have turned this into a $400 million film worldwide. I'd expect a sequel announcement at any time now. The Meg was certainly leggier than anticipated, nobody would have blinked had it fallen off a cliff immediately, but the weak late August slate kept it in the minds of audiences and turned it into a late summer hit. Mission: Impossible - Fallout adds $7 million in its sixth weekend and crosses an important milestone as it has now earned $204.3 million to date. Only the eighth 2018 film to do so (there are now 19 $100 million films as both Crazy Rich Asians and The Equalizer 2 crossed it this weekend), Fallout is now just behind 2011's Ghost Protocol ($209.3 million) and 2000's M:I 2 ($215.4 million) for the best in the franchise. It's been a remarkably consistent franchise for the last 22(!) years, minus the time where we all rejected Crazy Couch Jumping Tom Cruise. Also a beneficiary of a weak August, Fallout will probably start losing screens to the higher profile September releases, but in two more weekends we're looking at the biggest Mission: Impossible film to date. Our first opener is in fourth place on the weekend as Operation Finale musters $6 million on the weekend after an inexplicable Wednesday opening where it earned $1.7 million in the first two days of release. A post-World War II drama about the capture of former SS officer Adolf Eichmann (played by Ben Kingsley), MGM tossed this one out on a bad weekend for new movies, and this is the result.